This monumental acquisition appears to be either a stroke of genius or a gigantic blunder by Google’s new man in charge co/founder Larry Page? Motorola Mobility is a division of Motorola which sells most of the Motorola consumer products we are familiar with like cell phones, tablets, modems, cable top boxes etc. This division has been losing money for years since the demise of its once market leader the Razor phone. Last years loss was $56 million dollars. Why would Google pay $12.5 billion dollars offering Motorola’s stock holders a 63% premium for a company that loses millions of dollars a year? Common tech pundit thinking and the reason stated by Google itself is that the search giant plopped down billions to gain access to, and control of, Motorola’s vast collection of electronic patents. Over 17,000 of them which have either been filed and granted in a defensive move to fend off the many patent lawsuits filed mostly by Apple (think nuclear mutual destruction theory). Google who’s motto is “do no evil” claims it took this action as a defensive measure on behalf of its manufacturing partners to help defend them from lawsuits. These partners that manufacturer Google’s Android smart phones and tablets like Samsung, HTC, Sony and Motorola have been hobbled by litigation from Microsoft and Apple. Most of these lawsuits have of late been leaning in favor of Apple and therefore have caused considerable anxiety and fear among Google’s independent developer and manufacturer communities. Unlike Apple who has a vested interested in protecting its intellectual property and who has been very aggressively defending its platform by indemnifying its developers against lawsuits and stepping up in court to fight for them. Google has been marginalized by Apple’s brilliant strategy of suing Google’s partners. so far Google has refrained from defending its software in court choosing to leave its partners to fend for themselves. Recently Judges around the world have been issuing injunctions against Android manufacturers pending further court rulings in favor of Apple stopping the sale of some Samsung and Motorola smart phones and tablets. Ironically as a result of one of these patent infringement cases Microsoft receives income from every Android phone (a competitor to its very own Windows 7 phone) sold. Nice work if you can get it! We may have to wait months to see if Google pulls out its arsenal of patents to come to the rescue of its developers and manufacturers. It will take at least six months for DOJ approval of the acquisition. Now this is where it gets tricky, and very telling! Why would Google after years of promoting their “open” operating system approach of providing a free (as in no licensing fee) open platform for hardware makers seem to do an about-face and manufacturer their own phone? Their original approach was designed to emulate an earlier strategy that Microsoft employed and enjoyed during an earlier era in computer history which when deployed was able to almost extinguish Apple from the face of the earth. Basically by copying (stealing) Apple’s OS software ideas repackaging them as Windows and licensing the software (in Google’s case give it away) to hardware manufacturers to build the PC, Microsoft was able to dominate the personal computer business for twenty-five years relegating Apple to a bit player. In this era, Google sought a redux of that earlier strategy. From the casual observer’s point of view this strategy appears to have been working fine, in just two years Android commands a dominate 46% share of the smart phone market and is activating 250,000 phones a day. The problem is Apple is the only one making money! That’s Right, Apple with its 8% worldwide share of the smart phone business is reaping 76% of the money.To the tune or should I say iTune of almost $60 billion a year on track to hit $90 Billion dollars this year. Turns out that Google by giving the software away is losing money. Google had hoped to recoup this loss with increased search and advertising revenue. So far it’s to early to tell if that pans out. As its turns out it’s getting more and more expensive and more and more damaging for Google to be involved in Android.Google’s poorly planned and hastily devised strategy and execution has caused their smart phone platform to become fragmented. Even Android developers are complaining that not only are they being sued because of Google’s Android software but users are not buying many apps. It turns out that the Android user culture is lets say, a much more fiscally conservative bunch who prefer fee apps. Different operating system versions running on different hardware, viruses as a result of a non-curated app store, inferior apps are all combining to scratch up Google’s once stella brand and leaving a bad taste on its consumers palate. Google’s partner phone manufacturers are having a hard time competing with Apple’s brilliant organization. As the numbers begin to roll in , it appears that only two companies can make a business on smart phones, Apple and Samsung. Samsung who on one hand competes with Apple also receives $6 to $8 billion dollars a year from Apple to their manufacturing business which they risk losing if they continue to steal ideas and copy products from their best customer. Changing their OS would solve all their problems. Apple’s Strategy of controlling the vertical market (owning every step of the process) this time around proves to be very effective. So what is Google to do? Either Google will dump Motorola’s manufacturing branch, putting thousands of people out of work and creating a PR disaster or they intend to emulate Apple. If Google intends to manufacture their own phones thru Motorola and emulate Apple they have a some big hurdles to overcome. Can Google scale to match the type of production needed for worldwide distribution. Unless they steal Tim Cook from Apple , build factories, organize a hardware division, co-ordinate, analyze, trim and motivate 19,000 additional employees and develop a killer phone without scaring off their partners in trouble. They will need to abandon their open platform philosophy, maybe forcing their only profitable phone manufacturer right into Microsoft’s waiting arms. Develop Google+, Google TV, Chrome OS, music and hundreds of other projects all while keeping focused on Search to prevent Microsoft with Bing from catching up. 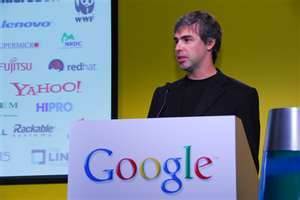 Focus has not been Google’s strong suit the tech landscape is littered with Google initiatives. Design and provide world-wide customer service platforms to help service their phones and software issues, remember they do not posses the retail distribution channels Apple has perfected. This truth seems pretty clear and can only lead to one conclusion Larry Page Flinched and Flex. Larry Page’s desire to be a player is the true motivation for this move , his anxiety over being relevant in the tech world and his need to establish command and respect were factors. Although Google can afford to cut him some slack, once , he has wasted a lot of the share holder’s money and will be throwing good money after bad. He has used up one life: Not Smart, leaving Eric Schmidt wearing the Cheshire cat smile.